Ever wonder how bodybuilders and fitness models get shredded before competing? What strategies are they using to cut water weight? For many people, fluid retention can be a nightmare. Some gain up to five pounds from one day to another every time they eat salty foods. Water weight makes them feel bloated, fat, and heavy despite eating clean and working out. I’m one of those people who hold water easily. No matter what I eat, I retain water. This problem gets worse when I eat cheese, salad, soup and other salty foods. For instance, if I have chicken soup for dinner, I wake up the next day with puffy eyes and up to six extra pounds! Fluid retention makes me feel miserable. Diuretics are not an option – at least not on long term – because they may cause cardiovascular problems and mess up the electrolytes in your blood. The same goes for Clenbuterol, the popular drug used by fitness buffs and bodybuilders. This product does work, but it’s not safe in the long run. In the long run, #diuretics affect cardiovascular #health and electrolyte levels. Dandelion root is one of the safest and most powerful natural diuretics out there. This plant can help you lose water weight in just a few hours. Compared to regular diuretics, it has no side effects and doesn’t cause jitters or heart palpitations. Personally, I’ve noticed that it works best when combined with intermittent fasting. So, if you’re wondering how to lose water weight overnight, drink one cup of dandelion tea in the evening. Avoid eating afterward. 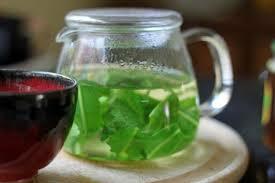 For a more intense effect, have a cup in the morning or afternoon too. Besides its diuretic properties, dandelion tea helps flush out toxins from the liver, improves digestion, and reduces bloating. It can be used on long term, but this may cause dehydration. I only use it two or three times a week, and it has great results! Another simple way to lose water weight is to drink distilled water. It works because distilled water depletes the body of sodium by attaching to it. Compared to tap or filtered water, it has no sodium, potassium, or fluoride. This type of water absorbs toxic substances from the body and eliminates them. Many bodybuilders fast using distilled water to lose excess fluid before competing. The downside is that you’ll also lose electrolytes (potassium, sodium, and chloride) and trace minerals, which may cause high blood pressure and arrhythmia. For this reason, it’s recommended to have an electrolyte drink (such as Gatorade) when using distilled water. Use this strategy only if you’re getting ready for a competition or want to slim down really fast. 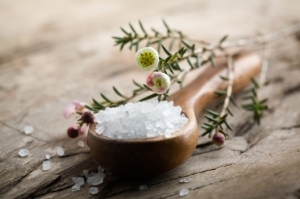 Bathing in Epsom salts helps reduce water retention naturally. Many celebrities and gym goers swear by Epsom salts for a flatter stomach. It’s a great way to de-puff your skin, revive muscles, and flush out toxins. All you need to do is to mix two cups of Epsom salt in warm bathwater, and then soak on for 15 minutes. Do it two or three times a week to get rid of bloating and cut water weight. I’m a big fan of intermittent fasting. This practice not only helps you break through plateaus but also reduces bloating and water retention. When fasting, your body will get into ketosis. As a result, it eliminates excess water. Have you noticed that if you don’t eat for at least five or six hours, you pee more often and get a flatter stomach? Short-term fasting reduces inflammation in your body and eliminates toxins. Not to mention its benefits on muscle growth! An overwhelming number of studies have shown that intermittent fasting increases growth hormone levels, improves insulin sensitivity, and regulates blood sugar. I’ve covered this topic here: Intermittent Fasting Diet: More Muscle, Less Fat. 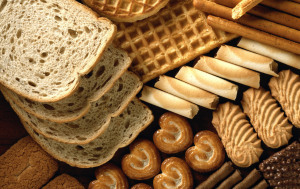 Each gram of carbs holds three to four grams of water. By cutting back on carbs, the excess water flushes away as well. This explains why most people can easily lose up to 10 pounds when starting a ketogenic or low carb diet. It also explains the alarming weight gain in the day following a cheat meal. So, if you’re asking yourself how to lose water weight overnight, keep your carb intake to a minimum (less than 50 grams a day). At the same time, reduce your sodium intake. If you cut back on carbs but eat salty foods, you’ll hold water. One gram of carbs holds 3 to 4 grams of water. By cutting back on #carbs, you’ll lose water weight. Drinking more water can actually help you get rid of excess fluid. When you’re dehydrated, your body tends to hold water. Thus, dehydration can make you look bloated and fat. Regardless of how you’re planning to lose water weight, stay hydrated throughout the day. Coffee and tea are natural diuretics. If you hold water, have more caffeine. Personally, I don’t recommend more than two cups of coffee a day because it may cause palpitations and jitters. However, some folks can tolerate larger amounts of caffeine with no side effects. To lose water weight quickly, you may drink coffee and tea, including on the days when you’re fasting. It really works. Do you have any tips on how to lose water weight overnight?